On the heels of an increasing battle between the Trump administration and various agencies, today the man who has become legendary for his predictions on QE, historic moves in currencies, warned King World News that people need to get ready because governments and the public are going to start panicking as this frightening global collapse unfolds. Egon von Greyerz continues: “There are times when there is still upside potential in markets which are making new highs. 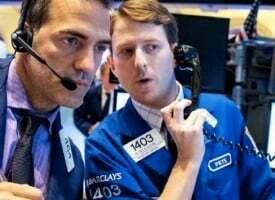 But a market that has been rising incessantly for almost seven years and which is grossly overvalued on any criteria is certainly not a low risk investment. Sadly, not many investors understand the notion of buying an asset which is unloved and undervalued, like gold and silver at the turn of the century. Currently all financial assets are overvalued and this is why we will see the most massive collapse of the financial system. Most sovereign bonds will go to zero as governments default or issue debt moratoria, which is a technical default, and stocks will fall by over 90% in real terms. The highly leveraged banking system will not survive the breakdown of bond and stock markets and will eventually default. But before that, panicking governments will print unlimited amounts of money in a desperate attempt to save the system. Instead of saving the financial system, the effect of the money printing will be hyperinflation and a total collapse of most currencies. Since 1980, financial assets have become an ever increasing share of total investments. At that time real assets were almost 50% of total assets. 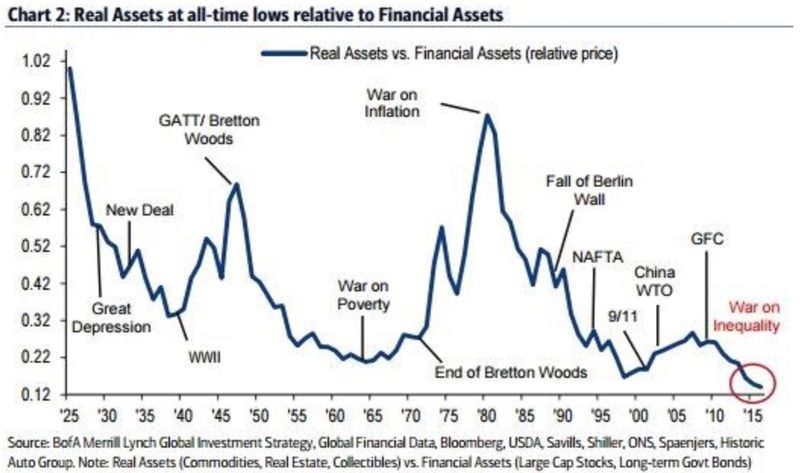 But the money printing and credit creation in the last 36 years have pushed real assets down to just over 10% of total financial assets as the graph illustrates below. What is notable is that real assets in this case includes real estate. Since the property market is also a massive bubble fueled by credit, the remaining real assets of commodities and collectibles become well under 10% of global assets. Looking at the chart above, we see that real assets are at an old time low vs total assets. This means that any investor who wants to preserve capital should exit stocks and bonds and also the property market and focus on commodities or real assets, excluding real estate. If we look at just the commodity element of real assets, we find that commodities as measured by the CRB index are at the same level today as they were in 1973. Since the 2008 high, commodities have plunged a staggering 60%! In spite of massive credit expansion and money printing in the last 43 years, commodity prices are extremely depressed. The main components of the CRB are Energy (39%) and Agriculture (41%). The CRB chart below confirms that the risk of inflation, as reflected by higher food and energy prices, is now substantial, and this situation is totally unsustainable. 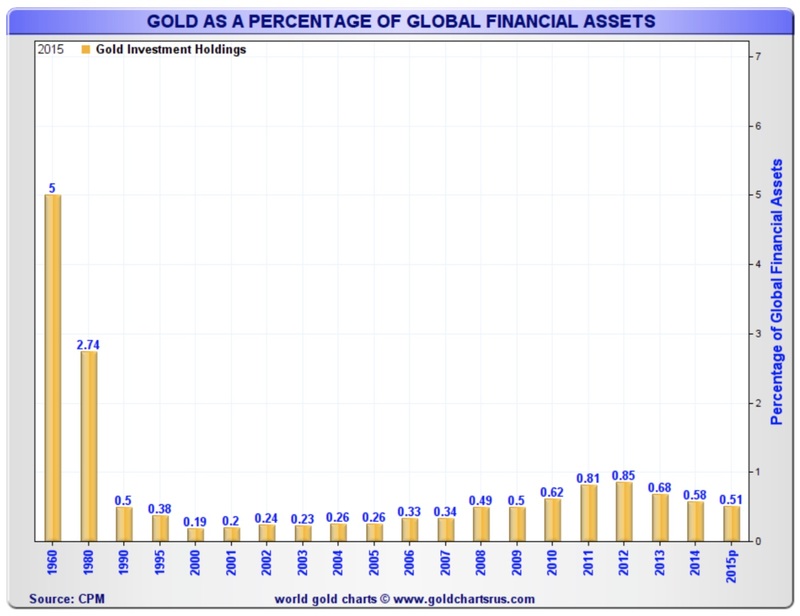 Gold and gold stocks are currently a mere 0.4% of global financial assets (the chart below ends in 2015). Gold as a percentage of global financial assets is near an all time low and very unlikely to remain at that level for very long. In 1960 gold was 5% of global assets, and in 1980 it gold was 2.7%. Even if gold’s share of assets return to only half of the 1980 level, it would mean a trebling of the current level of 0.4%. There is not sufficient gold in the world to satisfy such an increase in demand at the current gold price. This means that the price of gold would need to be 7-10 times higher than today’s price of $1,220. 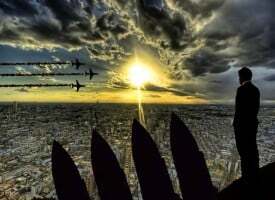 The combination of economic, financial and political as well as geopolitical risks are currently at a point which at any time can trigger a major panic in the world economy. For a long time I have been talking about the collapse of the European Union – a failed experiment conducted by the European elite. Victor Sperandeo’s excellent KWN interview correctly highlights that the implosion of the EU, which started with Brexit, could accelerate with the elections in the Netherlands and France. 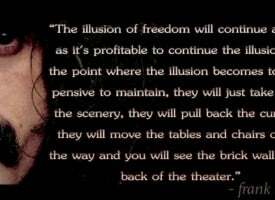 There are currently many potential catalysts in the world which can start the inevitable global collapse. 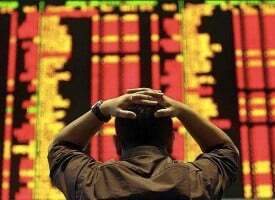 With irreparable problems in Japan, China, Europe, the US and emerging markets, very little is needed to trigger the fall of the global financial system. It is impossible to forecast if the trigger will be, for example, Trump’s tax cuts and infrastructure spending, or a breakdown of the EU. The fragility and the interdependence of the world economy means that a problem anywhere in the world will spread like wildfire around the globe. A major fall in the US Dollar Index, which is very likely, could be the unexpected shock in a world expecting further dollar strength. The Dollar Index is already down 4% since early January. Or the trigger could be upsets in the coming elections in the EU, which would put major strain on Europe’s already bankrupt banking system. Or it could be the failed Japanese economy which starts sinking into the Pacific. Whatever the catalyst is, the next phase will be a massive money printing program leading to inflation first and soon thereafter hyperinflation. Not all assets will be affected by hyperinflation. As the chart above indicates, commodity prices, especially food, physical precious metals and precious metal stocks, are likely to surge in price. But most of the assets which have boomed due to the credit bubble, which are stocks, bonds and most real estate, will not be affected by the coming hyperinflation. Instead these assets will decline 75-90% in real terms. My good friend Clif High uses Predictive Linguistics to forecast major trends in the world by analyzing billions of words typed by humans on the internet. 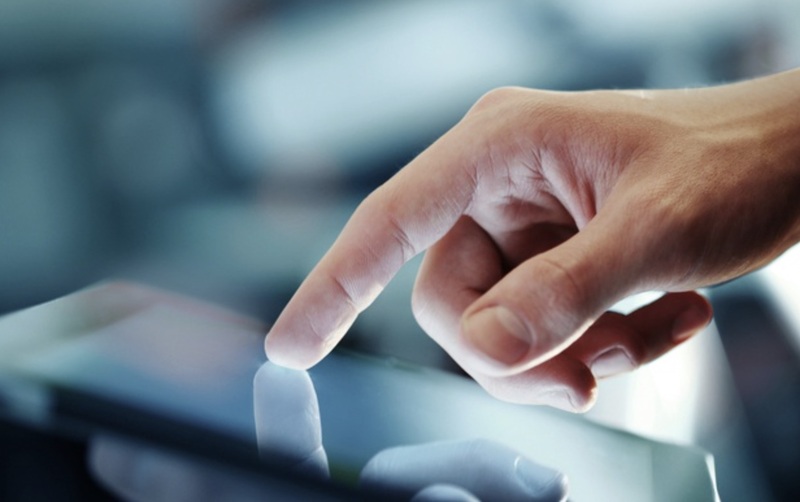 It is a fascinating and a unique method which confirms what the charts tell us above. His system indicates that hyperinflation is imminent leading to a surge in gold and silver, bitcoin and also in food prices. 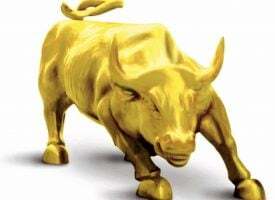 As I have forecast for many years, physical gold and silver will reflect the coming upheaval in the world economy and financial system, leading at least $10,000 gold and $500 silver in today’s money and much higher in hyperinflationary money. 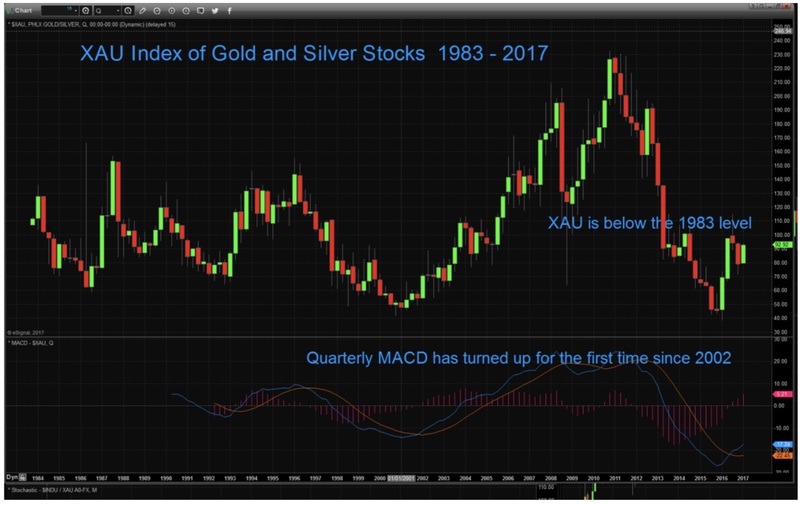 Although gold and silver stocks do not represent the same level of wealth preservation as physical gold and silver, the XAU Index certainly confirms the coming surge in the precious metals. This index is currently below its inception level in 1983. 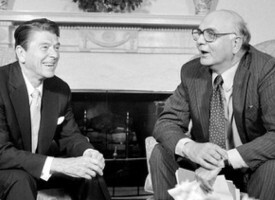 Bearing in mind that the Dow is up 16-times in price since 1983, the XAU currently represents exceptional value. ***KWN has also just released the remarkable audio interview with top trends forecaster in the world Gerald Celente and you can listen to it by CLICK HERE OR ON THE IMAGE BELOW. ***ALSO JUST RELEASED: Multi-Billion Dollar Fund Manager’s Doomsday Prediction Sends Shockwaves Across The Internet CLICK HERE.